Christmas movies are a tradition on TV during the holidays. The biggest question is which ones to watch. You have your Miracle on 34th Street, (both the classic and the remake). You have It's a Wonderful Life (which I watch on TV every Christmas Eve, whether anyone else wants to or not. No, I don't impose my will; I just trek off to another room if nobody else is up for it.) You have any number of a slew of versions of A Christmas Carol. You have cheesy Hallmark movies out the wazoo. And of course you have the ones that appeal to the rather twisted minds like me, such as Bad Santa, Santa Claus Conquers the Martians, The Mistle-tones, and even Scrooged, the Bill Murray twist on the traditional Christmas Carol story. 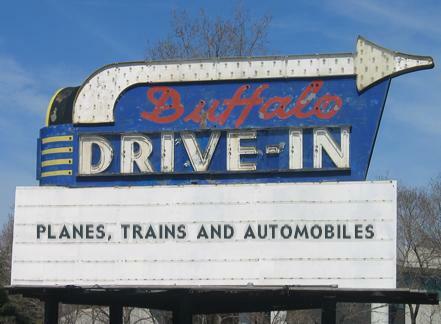 And then there's the John Candy/Steve Martin comedy called Planes, Trains and Automobiles. To tell the truth I really love this movie, but I completely don't get how it became a Christmas tradition. 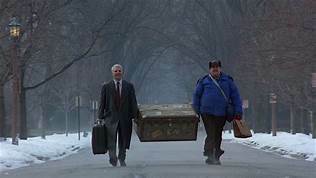 I mean after all, it's about two guys trying to get from New York to Chicago for Thanksgiving! But be that as it may, you do get snow, which some folks do like to have for Christmas Day, so that's one point scored for it. John Hughes, who gave the world such memorable classics as Ferris Bueller's Day Off and The Breakfast Club, and wrote the screenplays for many others, gave us this classic love-fest, as an uptight advertising executive, Neal Page (Steve Martin) is ultimately saddled with a well-meaning buffoon, Del Griffith (John Candy), as Neal attempts to get back home to his family in Chicago for Thanksgiving. Trying to catch a cab during rush hour proves to be problematic, too. 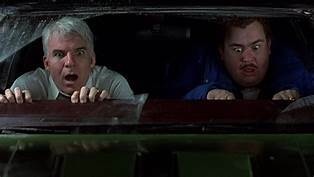 First he races another passenger (Kevin Bacon in a cameo), but trips over what turns out to be Del Griffith's steamer trunk. 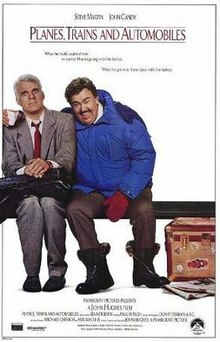 Then while negotiating with another potential cab fare for an available cab, Del (John Candy) steals Neal's cab away from him. But it won't be the last time that Del gets under Neal's skin, not even in the slightest. On boarding the plane Neal finds that his first class ticket has been downgraded to a coach set. And guess who is Neal's seat companion? Del. It turns out that Del is a crude, brash and annoying seat companion, the exact opposite of the uptight Neal. 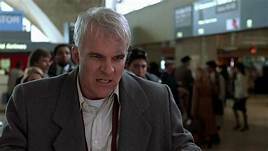 And to make matters worse, the plane is rerouted from it's original destination of Chicago to Wichita, KS. When flights to Chicago are all cancelled, Neal ends up taking Del's offer to go to a low-rent motel, although upon arriving it turns out all the rooms are booked and Del and Neal are going to have to sharte the same hotel room. Which wouldn't have been too bad if it were a double, but they have a single king bed instead. And Del manages to make things worse in his own inimitable way. Plus some malcontent breaks in to the hotel room and steals all the money from the pair. The two take a train, fortunately for Neal not seated together, but the train breaks down and fate casts the two together again. In town, Del manages to acquire bus tickets for the pair, but they only go as far as St. Louis. When Neal tries to get a rent a car, it is not there and, after a fruitless argument with the rental agent, attempts to hire a cab. But Neal is obnoxious to the cab manager who punches him and he falls to the street, where, guess who just happens to come along in a rental car? 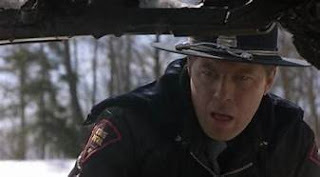 Del and Neal use the car to try to get to Chicago, but since Del is not the most attentive driver, the car ends up wrecked. Whereupon Neal finds out that through an inadvertent switch, Del used Neal's credit card to rent the car. And the car is not road worthy, as a police officer impounds it. Will Neal ever make it home? This being a feel good movie in it's basic form, you know what the answer is. But the trip itself is well worth the watch. Well, the old Plymouth may not be the best form of transportation, but its sure to get me home without any cops stopping me. Drive home safely folks. And have a great holiday season. A very funny movie that truly gets you in the heart. Never thought of it as a Christmas movie though. When my fiance that was (now hubby) saw this in the theatre one scene stood out. It was the singalong on the bus. He accurately saw me as Neal who would choose something like Three Coins in the Fountain. It was the most I ever saw him laugh in public. Nonetheless, we gave the world our special needs son who sings TV and cartoon songs on public transportation. It all evened out. If it was Christmas time I'd pick "I want a Hippopotamus for Christmas". I'm the ultimate oddball. Thanks for reading. Cute movie I have not seen in a while. I remember laughing a LOT! 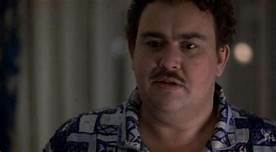 John Candy is sorely missed, what a funny, sweet soul! Love just about every movie Candy was in. Thanks for reading,Chris. well, Jingle Bells was written as a Thanksgiving song, so what the hell?! Wasn't aware of that.... Thanks for reading.